Ridiculously delicious curry filled with roasted sweet potato, fennel, red onion and fresh mint with a curry sauce that’s out of this world! Peel and cube the sweet potatoes. Toss in olive oil and lay out on a baking sheet. Roast in prepared oven for 30-40 until the sweet potatoes are soft, but not mushy. Set aside. Meanwhile, add diced fennel, red onion, curry powder, coconut oil and salt to a medium-sized cast iron pan. Saute on medium heat for 5-8 minutes, until onion and fennel or soft, but not over cooked. 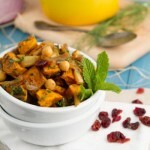 Add fennel mixture to a bowl with remaining ingredients, including roasted sweet potatoes. 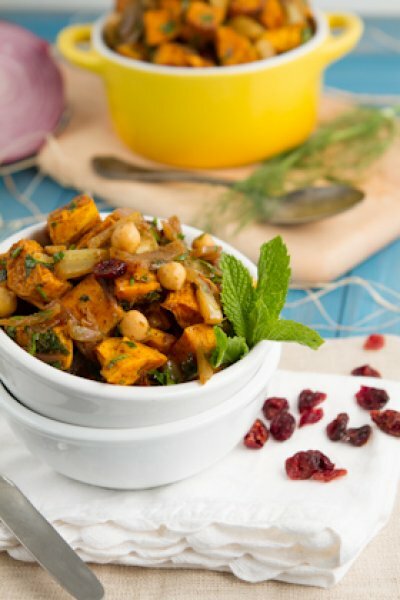 Stir to coat and serve alongside cooked rice or gluten-free naan.